Order online and your bespoke ring will be made and delivered within two to three weeks, or earlier if you’re in a hurry. Each ring comes with an engraving of your choice, if requested. Whenever you feel your ring needs refurbishment, just send it back to us, and we will repolish it and bring it back to new. If you don’t know your ring size please click here and we will send you a free ring sizer. Make an appointment to visit our showroom. Usually dispatched within 10 - 15 working days. 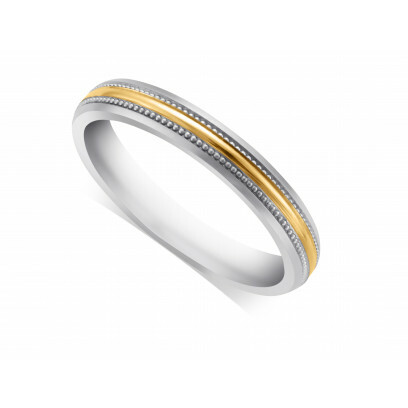 We know how much having our wedding rings mean to you. We offer instalment payments at 0% interest if the purchase is over £1000, and paid back within 12 months. If settled over 12 months, please click on Our DekoPay link to give you the exact repayment cost including interest on your purchase. 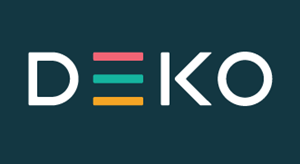 Finance is provided by DekoPay. To apply, add the item(s) to your basket and checkout. When you have reached the point to pay, choose DekoPay and the system will guide you from there. All our wedding rings are presented in our classic pillar box red leatherette double door box with a white velvet inside and a white satin inner lid. How safe is it for me to pay for my order online with you? We are totally committed to protecting your security and privacy at House of Williams London. The security of personal and credit card information is our highest priority. Therefore, all payments made through our website are processed by Secure Trading. When will I be charged for my item(s)? When you place an order with us online payment is debited immediately from your card. If a refund is required we will always refund you immediately providing your payment has cleared in our bank account. Can I pay by any other method? Yes you can pay by personal cheque. 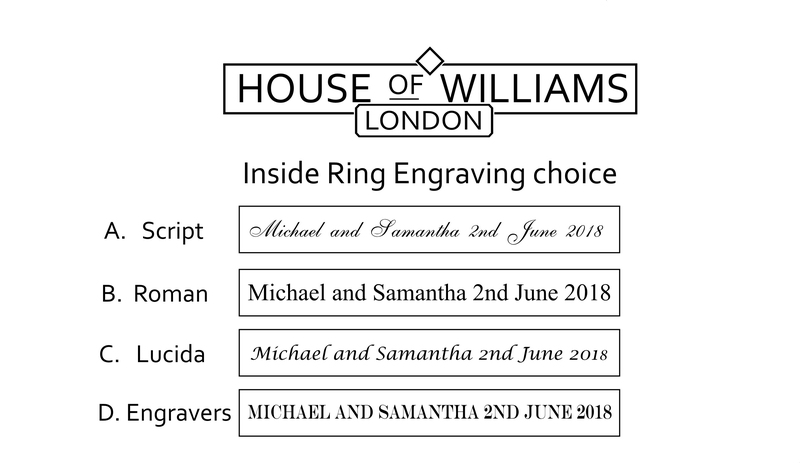 If paying by personal cheque please make cheque payable to Jewellery Cave Ltd, then post your cheque with your order to: House of Williams London (Orders Dept) , 48b Hendon Lane, Finchley, London N3 1TT. Please note we do not despatch any items until the cheque has cleared. Please allow 21 days from when we receive your cheque for all items in stock. Some items may take longer if not in stock. What kind of packaging will my items be sent in? All orders will be supplied in a gift box and packed securely in a padded jiffy bag. All orders are sent to UK and EC addresses using the Royal Mail special delivery service, so they are all insured and fully trackable. We will email you to let you know your order has been despatched. Please allow 24-48 hours for delivery in the UK and up to 14 days for overseas addresses. Can I have my order sent to a different delivery address? Yes, you will be asked for a delivered address when you are in the checkout. The billing address must be the same as the details for the cardholder, but you can specify any address for deliver. Yes, you can change your order at any stage providing it has not already been personalised, i.e. your ring made to size or inscription engraved on the items. Should you wish to change your order please contact us as soon as possible on 020 8446 8538. Please have your order number ready. Yes, you can cancel your order providing it has not been already been made or engraved. Should you wish to cancel your order please contact us urgently on 020 8446 8538. Please have your order number ready. We will send you a confirmation email confirming that your order has been cancelled and a full refund will be made to your card once your payment has cleared in our bank account. Yes, you can. Simply log in to the My Account area on our website and you will be able to view your order progress. At any time please do not hesitate to contact us 020 8446 8538 if you have a question regarding your order. If you have not received your item(s) within the specified delivery time or have a question regarding delivery of your order please do not hesitate to contact us on 020 8446 8538. My order has arrived damaged. What can I do? We take great care to pack your item(s) securely and it is extremely rare that something arrives damaged. However should this occur please contact us immediately on 020 8446 8538 or email us at info@howweddingrings.co.uk. We will ask you to return the item(s) as per our returns instructions. Upon receiving the item(s) we will dispatch a replacement. You will be reimbursed for the cost of returning the item(s) to us. Please call us free on 020 8446 8538 or email us at info@howweddingrings.co.uk and we will be happy to assist you with the registration process. Please call us free on 020 8446 8538 or email us at info@howweddingrings.co.uk and we will be happy to assist you. Can I be sure that I am buying from an ethical company? We believe so. As a family business established for almost 40 years, we have always taken our reputation very seriously and we require all of our staff and suppliers to behave in a responsible and ethical fashion. We have a policy on ethical trading and we also support worldwide moves to ban the trade in ”conflict diamonds” and ”dirty gold”. These initiatives should give you the confidence to shop with us, but if you have any further queries, please email info@howweddingrings.co.uk. I would like more information about a product. No problem. Simply call us free on 020 8446 8538 or email us at info@howweddingrings.co.uk with your question. If you could include the product ID number that is located next to the product this will help us to deal with your enquiry efficiently. What guarantee comes with the product I am buying? All products carry a 12 months guarantee. This guarantee protects you against any manufacturing fault but excludes accidental damage and normal wear and tear. This does not affect your statutory rights. Finance applications take up to 48 hours to be proccessed. We also offer variable deposits with some options only available in store. Please contact our sales team should you have any questions. Order on-line and your bespoke wedding or diamond ring will be made and delivered within 2-3 weeks, or earlier if you are in a hurry! Each ring, if you desire, comes with an engraving of your choice, if requested. Each ring comes with a lifetime guarantee, and whenever you feel your ring needs a refurbishment, send it back to us, and we will always repolish and bring it back to new. Please note that the image in this popup gives you an idea of what your ring finish will look like. Kindly remember that the rest of the specs of your ring will be based on your order. © 2018 Jewellery Cave Ltd. All Rights Reserved.